Pro Rust Out® chemically removes iron and rust buildup that coats the resin bed and fouls the water softener. Pro Rust Out changes rust and iron into a clear solution that easily rinses away. It does not contain harsh or abrasive chemicals that damage fiberglass, porcelain or acrylic finishes. The advanced formula contains more than five chemicals formulated to clean, restore and maintain the life of water softeners. 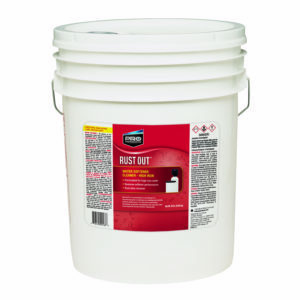 Pro Rust Out can also be used to clean tough rust stains from toilets, sinks, tubs, white clothes and exterior surfaces. Available in 4 (RO24S or RO100S) oz, 1.5 (RO12N) lb, 5 (RO65N) lb & 50 (RO50N) lb sizes. General Purpose Cleaning: Dishwashers, dishes, glassware, white clothes or fabrics, and water softeners – follow directions on the back of the package. Pro Rust Out is a white powdered mixture with a sulfur odor. • Rust Out is formulated to chemically change rust into a clear, soluble state that easily rinses away. [Fe3 to Fe2 (Ferric to Ferrous)]. Please contact us to order the Rust Out product or to find out more information.